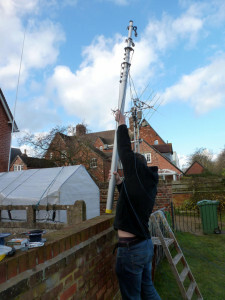 Since just before Christmas the UK has been getting battered by storms, normally this isn’t an issue and the antennas tend to stay up without any problem, however 2013 decided to change things a little bit and a couple of days before Christmas in one of the strongest storms that the UKs seen for years decided to change the antenna farm in the garden. To hold up the nested dipoles we have always used telescopic poles, they are easy to erect but also handy if you need to drop it in a hurry and I haven’t had one break – actually thats a lie as this one did break in half. This mast was well guyed using paracord which proved a bad idea as on inspection of the rope (only 5 months old) was starting to go powdery and with little force I could break it into pieces. 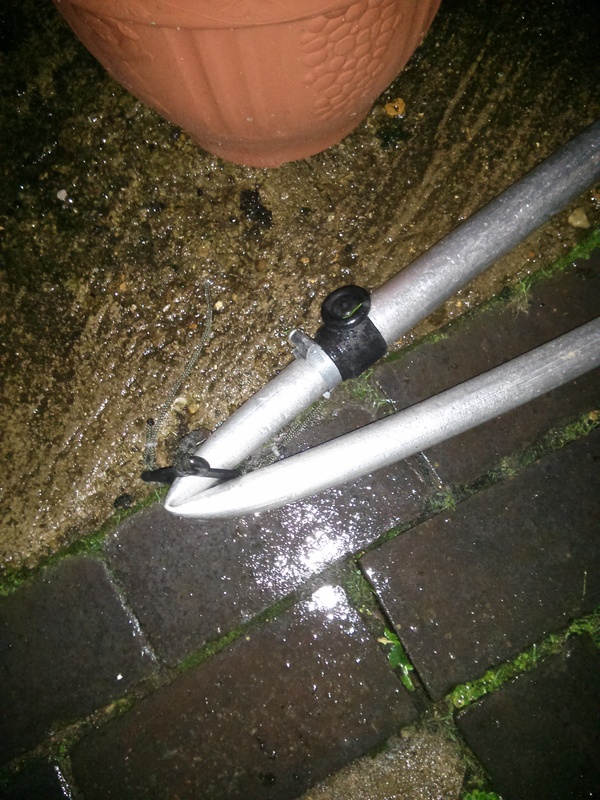 Thankfully the mast fell into the garden and the only thing that got hit was my satellite X-Quads but thankfully only the tip of the Diamond V-2000 as it came down, and all that was required as to straighten one of the 2m elements and we was back in business. Of course this did mean that by this point that there was no HF antenna. 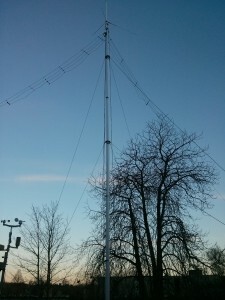 Once the gales had settled down, a quick replacement antenna for HF was erected in the form of a Hustler 6-BTV which was in the shed. this antenna managed to ride out the storms in the coming weeks till a replacement mast could be procured.. over the rest of Christmas and the start of New Year we got battered by yet more gales and heavy rain which caused a large amount of flooding in Oxford and other parts of the country. 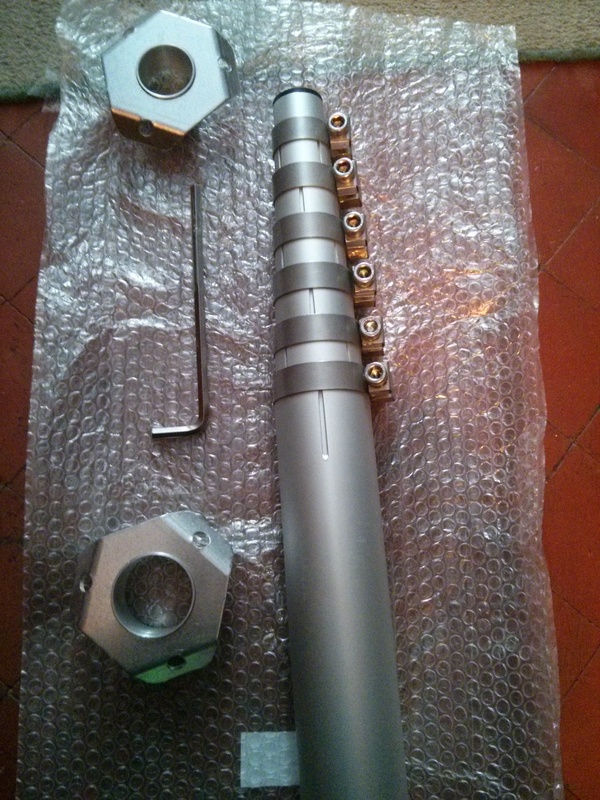 Once new year had passed I’d decided on a replacement mast in the form of a Spiderbeam Aluminium Telescopic Mast 10m (33ft) HD which although isn’t cheap it is high quality and looked ideal for holding up the nested dipoles, 1/4 80m L and the Diamond V-2000 so a few clicks later the mast was ordered along with the guying plates and 4 days later it arrived in the UK! Now its been up over a week without any problem and even suffered from gales at the weekend without any problem, if you after a good quality telescopic mast then I highly recommend it! 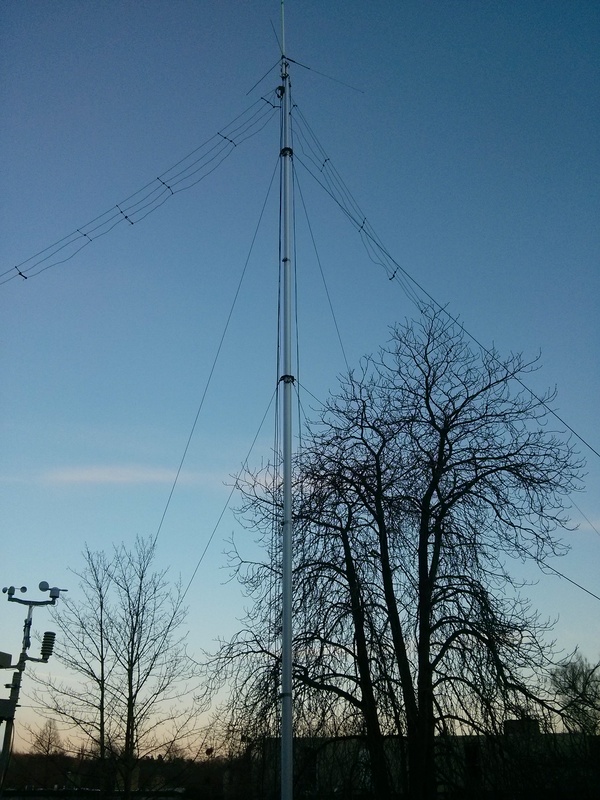 the only things left for me to do is get the hardware to stand off the dipoles and L from the mast to stop a bit of interaction but for now its working!